Earlier this fall we were very excited to announce a new strawberryluna + West Elm partnership as a part of the opening selection of Local, Pittsburgh & PA Makers in their #WeLoveLocal program. West Elm Pittsburgh at Bakery Square is proud to support Pennsylvania artisans + artisan-made products and we are just as proud to be a part of the West Elm family! To that end, Pittsburgh friends – come hang out with us tomorrow evening November, 6, 2014 from 6pm – 9pm at the new West Elm store at Bakery Square. Join us as well as many of the other PA & Pittsburgh Local Makers for a fun interactive evening to meet the makers of our LOCAL collection. Featured West Elm Bakery Square LOCAL Makers are highlighted on the West Elm blog, Front+Main. It’s our first craft show of 2013! Yay! We’ll be at the I Made It! 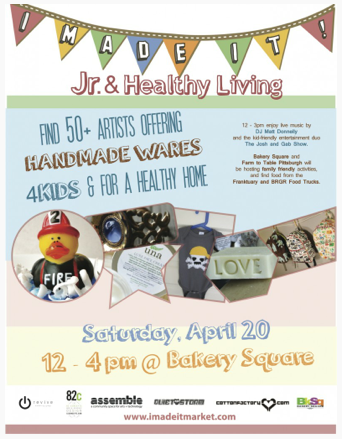 Market’s Jr. & Healthy Living show on April 20th from 12-4pm, vending and having lots of family friendly fun. We be bringing lots of Alphabet Prints and art prints as well as rock posters and lunch bags for the kiddos and grown ups alike. IMI! Jr. & Healthy Living is held at Bakery Square in the Eastside / Shadyside neighborhood. It’s a free and very family friendly event with over 50 vendors. There will be booths outside & inside too (we’ll be inside) and lots do for all ages! I Made It! 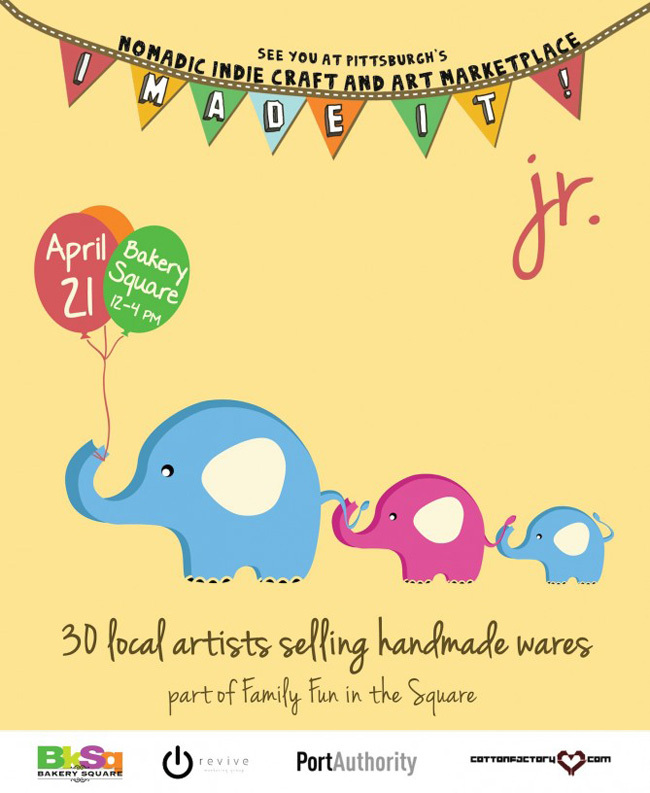 Jr. pops back into Bakery Square on Saturday, April 20th from 12 – 4 pm for a market filled with lovelies made for our littlest friends and family members. Find clothing, accessories, art prints, toys, plush, cards, backpacks, gift items, and more all locally crafted and handmade. This event also features healthy living options including natural bath and body products, beautiful ceramic kitchenware, repurposed and green housewares, organic clothing, vegan baked goods and more. So come on out and enjoy the day! What: I Made It! Jr. & Healthy Living show. I Made It! 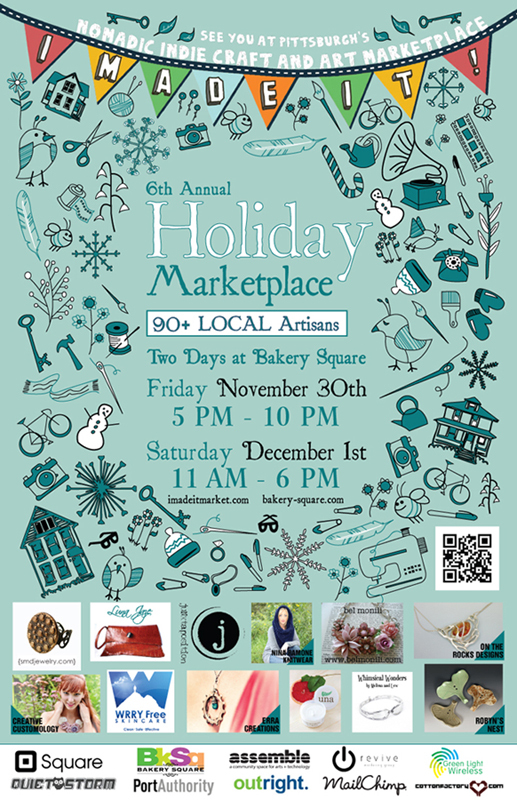 For The Holidays Market this weekend! The holidays are here! And the super handmade arts & crafty show I Made It! For The Holidays is almost here too! Handmade wares made by skilled artisans are happily one of the things that make holiday gifting so special in our fast-paced, high-tech world. Being a studio that truly hand pulls our silkscreen prints and posters, you better believe that we believe “Handmade Is best!” when it comes to finding that perfect gift for friends, family and co-workers for the holidays. I Made It! For The Holidays is FREE to attend with lots of kid & family friendly activities like Santa and adult fun like the TAPPED pop-up beer hall. Check out the IMI! Holiday Facebook page here for more details. So come join strawberryluna and over 90 local & incredibly talented makers for the super festive I Made It! For The Holidays Market this weekend! We’ll be manning our booth full of rock posters, art prints, Alphabet Prints, and a few brand new surprise items. Stay tuned! When: IMI! Holidays opens on Friday evening, November 30th from 5pm to 10pm & runs through Saturday (day) December 1st from 11am to 6pm. Where: Bakery Square in the Shadyside neighborhood of Pittsburgh, PA. Click for more information and directions to Bakery Square & parking info. Hope to see you there Pittsburgh! Click for more info about I Made It! Holiday Market! Just a zippy reminder about the I Made It! For The Holidays show this weekend at Bakery Square in Shadyside. It’s our last show of 2011 and we’re looking forward to going out with a bang. 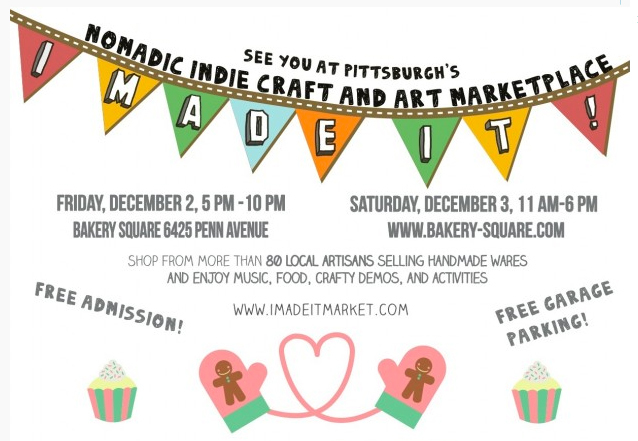 We’ll be vending with over 80 other artisans and crafty makers of awesome all offering our handmade works for sale for the holidays Handmade makes for special and fun holiday gifting! The shopping & holiday festivities will include over 80 artisans, demonstrations, music and merriment as shoppers warm up from the cold, see friends and make new ones, and best of all, cross all of the names off of their holiday shopping lists. 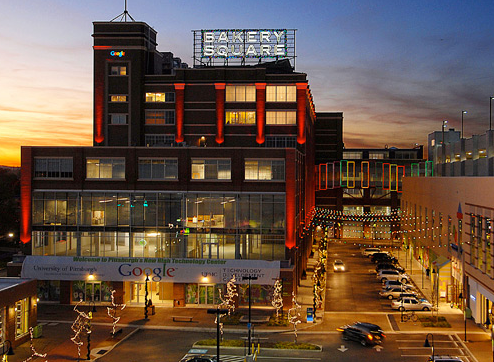 Bakery Square by night. I Made It Market is on the ground floor. Easy to find!